The immune system is composed of various types of specialized cells, proteins, tissues and organs. Its main function is the detection of harmful organisms and their destruction. 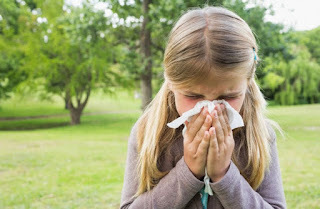 When the immune system mistakenly recognizes a particular allergen as harmful, then even though the allergen is not dangerous for the organism to activate immune responses aimed at destroying "the harmful pathogen." In this case it is a type 1 hypersensitivity reaction or an allergic reaction - an allergy. ~ Avoid the foods that your body doesn’t handle well. ~ If you think you have an allergy, ask your doctor to check it. ~ If you have a food allergy, you should carry an epinephrine auto-injector that you can use in case of emergency. ~ For serious reactions, including anaphylaxis, you’ll need to call 911 and you may be hospitalized. For milder symptoms, your doctor may give you an antihistamine or steroids. ~ If you know you have a drug allergy or think you might, talk with your doctor. The doctor may refer you for allergy testing. Many people call it “hay fever,” but pollen from many different plants can trigger an allergy. Symptoms include sneezing, runny nose, nasal congestion, and itchy and watery eyes. ~ Stay indoors on windy days or when pollen counts are high. ~ Keep windows closed. Use an air conditioner if you need to. ~ Don’t hang clothes out to dry when pollen fills the air. ~ Put dust mite covers over mattresses, pillows, and box springs. ~ Wash sheets weekly in hot water. ~ Keep all areas of your home, especially the bedroom, free of stuff that collects dust, such as stuffed animals, curtains, and carpet. ~ Avoid mold and get rid of things that encourage its growth. ~ Repair any water damage or leaks in your home. ~ You may not want to keep plants inside because their soil can hold mold. ~ If you rake leaves in the fall, wear a mask. ~ Make yourself unattractive to insects. Don’t wear brightly colored clothes and avoid scented lotions or cosmetics. ~ Keep insecticide handy, wear shoes outdoors, and stay away from outdoor garbage. ~ Talk to your doctor about allergy shots. They can help prevent anaphylaxis. You might react to the proteins from oil glands in an animal's skin or proteins from an animal's saliva. ~ Avoid the animals that cause your allergies when possible. If you’re allergic to your pet, ask your doctor if there’s anything you can do that would help, like keeping it off your bed and couches. ~ Wash your pet every week. ~ You can also take medications such as antihistamines, decongestants, and nasal steroids to help. ~ If you have cockroach allergies, be sure to keep trash in closed containers and take it out of your home promptly. ~ Avoid anything that has latex in it. ~ Wear a bracelet that lets people know you have a latex allergy.